Ospreys are on the rebound after a troubled past. 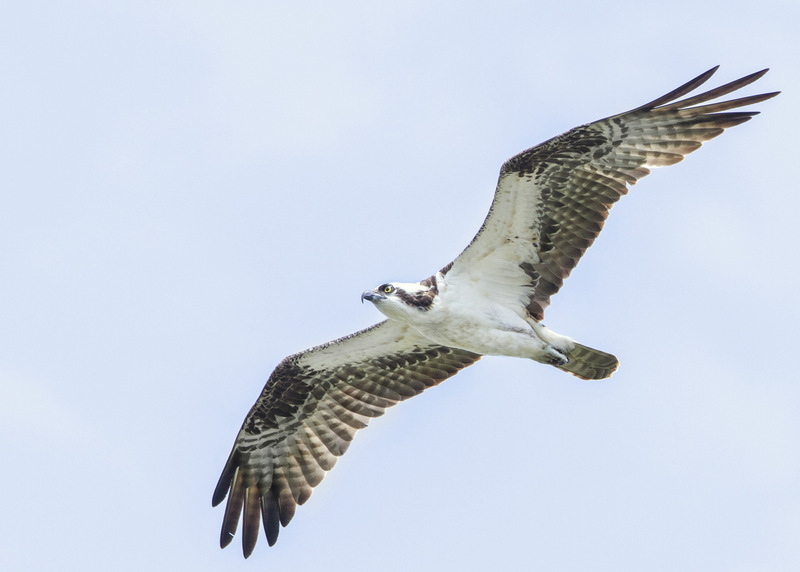 Despite a history of pesticide poisoning, persecution, and population declines, Ospreys have returned as one of the most abundant raptors of the coast. Today, the Osprey’s story stands as a testimony to the power of scientifically-informed environmental activism. Osprey numbers crashed dramatically following the widespread use of DDT, a pesticide deployed across America in the 1940s. While previous decades saw Ospreys hunted as “pests” and their wetland habitats drained for development, the introduction of DDT all but rang the death knell for the entire US Osprey population. Nobody realized it at the time, but DDT builds up in animals’ body tissue, and persists in the environment years after being sprayed on farm fields. This spelled trouble for birds of prey: while DDT spraying rarely poisons adult birds to death, it destroys the structure of raptors’ eggshells, preventing them from reproducing. As a result, Ospreys declined by over 90% between 1950 and 1970. When the now-famous environmentalist Rachel Carson finally named DDT as the culprit in her book Silent Spring, the discovery ignited a movement. A coalition of the National and Massachusetts Audubon societies, as well as local land trusts and nationwide advocacy groups, intervened on behalf of all species threatened by DDT. They sued the Environmental Protection Agency to ban the pesticide—and won. A few decades later, Ospreys are almost back to their pre-DDT abundance. The DDT ban eliminated a significant threat to Ospreys, but the bird didn’t immediately bounce back. Even in places with clean water and plenty of fish, Osprey numbers are naturally limited by the number of appropriate nest sites. They normally require a tall, dead tree at the edge of a marsh, but lacking standing trees in the open, they settle for utility poles or other problematic locations. Artificial nest platforms are one solution. In addition to keeping Osprey nests away from telephone wires and buildings, nest platforms increase the number of Ospreys any wetland can support. With wetland edge habitats constantly losing ground to development, it’s critical to maximize the number of Osprey nesting in appropriate wetlands. Mass Audubon’s South Coast Osprey Project maintains about 100 Osprey nest platforms. The project also monitors and records data on the Osprey population, including banding and tagging several birds, and tracking their movements. The data never fails to yield exciting results— whether demonstrating Ospreys’ reliance on the spring herring migration for food, or revealing variability in Ospreys’ choice of wintering grounds (South Shore birds end up in places as far away from one another as Cuba and Bolivia). If you love Ospreys as much as we do, consider sponsoring a nest platform! 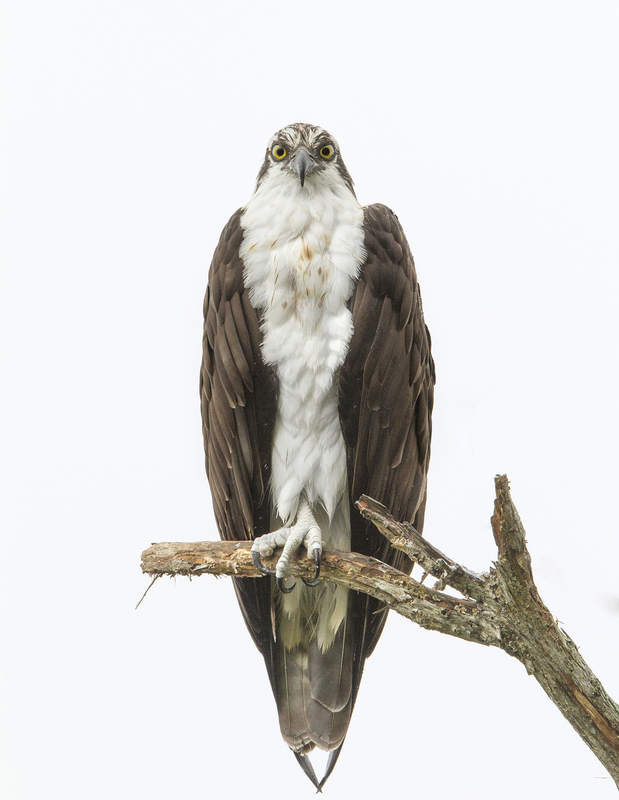 This entry was posted in Birds and Birding, Conservation Success Stories, History, Research and Monitoring and tagged DDT and eggshells, Osprey conservation, Osprey project, Ospreys, Ospreys and DDT on August 1, 2018 by William Freedberg. Studies indicate that Will Freedberg occupies the ecological niche of a semi-nocturnal generalist. His habits change seasonally, doing fieldwork and bird surveys in the summer, but also blogging, coordinating volunteers, taking photos, and doing background research. Life history traits include growing up in Boston and reluctantly graduating from Yale College. Behavioral research shows that William occasionally migrates to the tropics to seek out Hoatzins, pangolins, and sloths, but mostly socializes with his age cohort in urbanized areas of eastern North America. He is short-sighted, slow to react, and a poor swimmer.